Before we get into the stories of Jesus’ post resurrection appearances, we will take and opportunity to pause and reflect on significant experience, memories, and images from Lent, Holy Week, and Easter morning. If you need an update on what our children did during this period of time, check out the recap post here. Lent: A long time ago, we talked about the Good Shepherd and the sheep for whom he lays down his life. Do you remember this story? What do you remember about it? Who was the Good Shepherd? What did he do? What was your favorite part of the story? Is there another story you liked better? Did it feel like Lent was very long? Did you do anything special at home during this time? Did you do anything special at the church? What did you do? Holy Week: There were a lot of services at the church during Holy Week. Why do you think so many people came to the church so many times? What did you do when you came to the church? Did you wash someone’s feet or did you take the Eucharist? Did the church look different or change a lot? What did you think about those changes? Some of the changes were very dark and some of them were beautiful. What was your favorite time coming to the church? Do you remember how many new people were baptized? Was there anything new or different in the church that you had never seen before? Easter: The first day of Easter was last Sunday. That’s the first day out of 50 days and it seems to be one that people really like. If you came I bet you met a lot of people that you had never met before, and it was fun to have new friends on such a festive and celebratory occasion. Did you come to church on Easter morning? Did anything special happen? What happened to the alleluias that we buried a long time ago? What story did you hear? Why do you think we were having such a good time after all of the time we spent with the sad/rough stories? The 3+4 year old class may want to abbreviate this part and can do so by talking briefly about each of these changes. Teachers in this class may want to narrate the changes a little more and then ask what the kids thought of it. Some of your children might have been in the nursery most of the week, but they might still remember some of the stories. After your conversations share an art response together. Several are suggested below, but you are not limited to these. (1.) Word Art: As a class create a list of words that describe the experience of Lent, Holy Week, and Easter, respectively. The create word art of the cross, the empty tomb, Eucharist, or any of the other symbols and motifs we have talked about. Here is an example of what your art might look like. If you do this, please take pictures to send me. (2.) Alleluia Poster (older children): I have a large alleluia poster with the Lamb of God (looks like this). The poster has grapes, bread, and host of other significant symbols that your class can talk about. Most of the symbols have a story or two corresponding to our Lent, Holy Week, and Easter lessons, programming, and worship. Color in the poster together (if possible, I will hang it in your class. If you have one of the preschool classes, then I can hang it in one of the classrooms that only Holy Family uses). Older classes may have an interesting conversation about Christ as the Paschal Lamb. Didn’t we say Christ was the shepherd and we were the sheep? (3.) 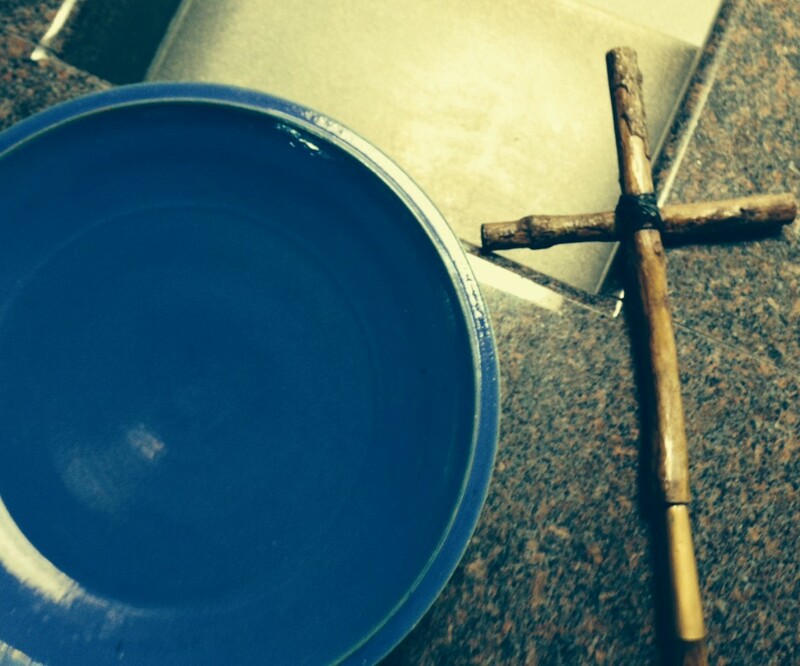 Life of Jesus Cross: Make this Easter, Life of Jesus cross craft. Talk about each of the stories. We talked about all of them in Sunday School this year and many of them during the Lenten season. (4.) Community Cross: Before your class comes in, cut a large cross out of paper, then cut it into squares of different sizes (remember to number the backs so you know in what order the pieces go. Ask each student to color one of the squares. When all are finished, put the pieces of the cross back together (together) to create a cross mosaic. You can find an example here. (5.) Lent Journals: It isn’t Lent anymore, but it will be nice to wrap up our Lent journals with a small reflection from the other side, the Eastertide side. You may ask they to artistically depict what happened after Lent. In some of the classes you may also want to give children an opportunity to go back and finish creating something they were unable to finish. Older children might choose four or five words to describe what the experienced during each Lent, Holy Week, and Easter. Or, perhaps you would like your students to write a reflection or draw a response to the prompt “who is God?” or “Who is Jesus?” Some children may like to write/copy one of the prayers you used, or copy Psalm 23 (an image we worked with a good deal, but a text we did not). Give your students an opportunity to share what they have written or created. Since this is the last time we will use our lent journals, please send these home with the children.